Rudy: With a light day and some free time, I decided to make my way to Micklethwait Craft Meats, a barbecue food trailer that has received lots of high praise over the last couple of years. It has made appearances on Jimmy Kimmel Live the past two years when he has brought his show to South By Southwest, plus numerous other write-ups. Plus, Mrs. Rudy had given me a gift card for my birthday, so I really had no excuse not to try it out for the first time. Monk: Wow, good job by Mrs. Rudy. She really knows the way to her man’s heart. Rudy: I showed up shortly before they opened for lunch and found a small line, but nothing too bad. That seems to be what is to be expected at most of the good barbecue places now in Austin. However, once the line started moving, it took forever! This is my biggest complaint with Micklethwait, the speed at which everything seemed to move. It took about an hour to move through the 15 or so people in front of me in line (add to that fact, you are standing in the heat the entire time you wait). That might not be that bad if it weren’t for the fact that it took 15 minutes after ordering for your food to be ready. Most places cut the meat when you order and hand it directly to you, but not here. I don’t know if it is due to the lack of space or help, but La Barbecue has a similar setup and ran like a well-oiled machine compared to Micklethwait. Even though it is a food trailer, Micklethwait has picnic tables with permanent shade constructed over it. That definitely helps with the heat while you are eating. When my food arrived, I was very hungry and ready to dive right in. First was the brisket, and it did not disappoint. 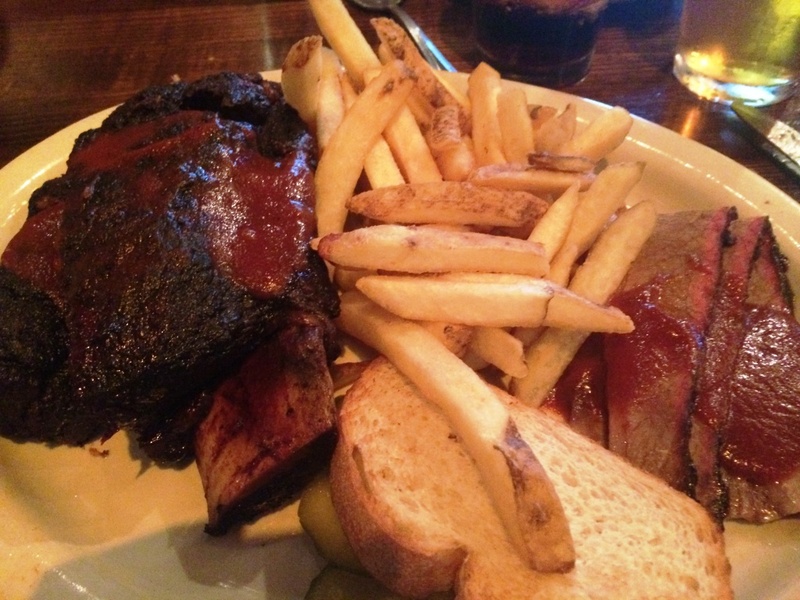 It had a great bark with lots of smoke, but the meat was very juicy and tender. It pulled apart easily without a need for utensils. They offered a sauce on the side, which added to the meat, but was not needed. In order to not have a meal of meat on meat, I next moved to the jalapeno cheddar grits. These were fantastic. They had a great jalapeno flavor and tasted of smoke, but the heat was not overwhelming. I think they were the star of the meal. They were so thick that I didn’t eat all of them for fear of filling up too much on sides. Lastly, I moved to the beef rib. I had not ordered a beef rib in a long time, usually opting for sausage instead, and usually because of price and the sheer size of the ribs. 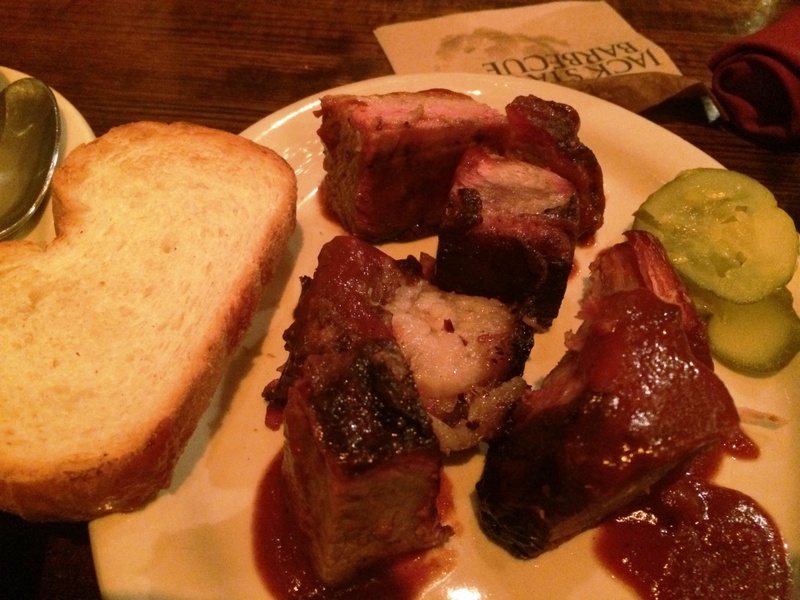 But Micklethwait has had good reviews of their beef ribs, so I decided to give it a shot. This was a mistake. The flavoring was good, which is the reason for it getting 3 hogs, but it was way too fatty. They had also either not let the fat render long enough, or had let it sit and reset, because there were large sections of hard fat throughout the rib. You can tell from the picture that there is a big ribbon of fat that is not rendered running through the middle. Monk: Yeesh, that is not so appetizing. So, question, upon finishing your meal, did you have any regrets in having waited so long? 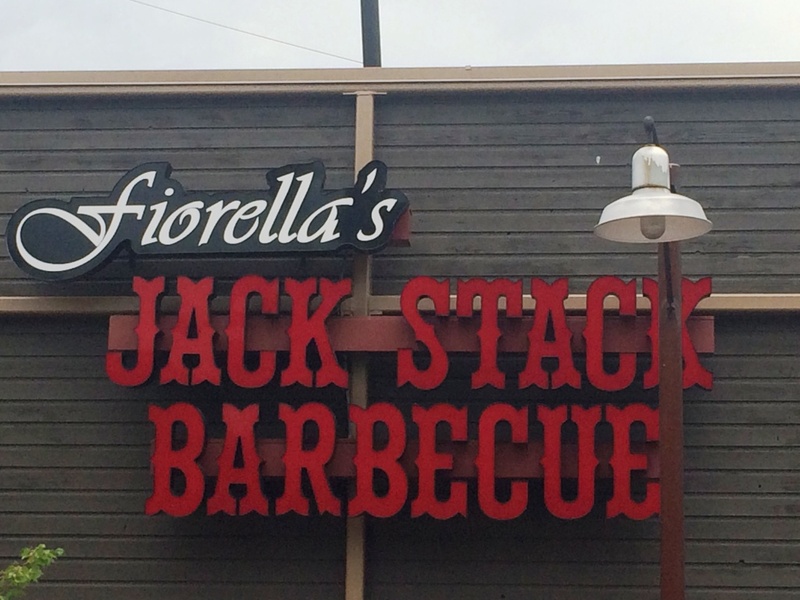 And where would you rank them in the Austin barbecue hierarchy. 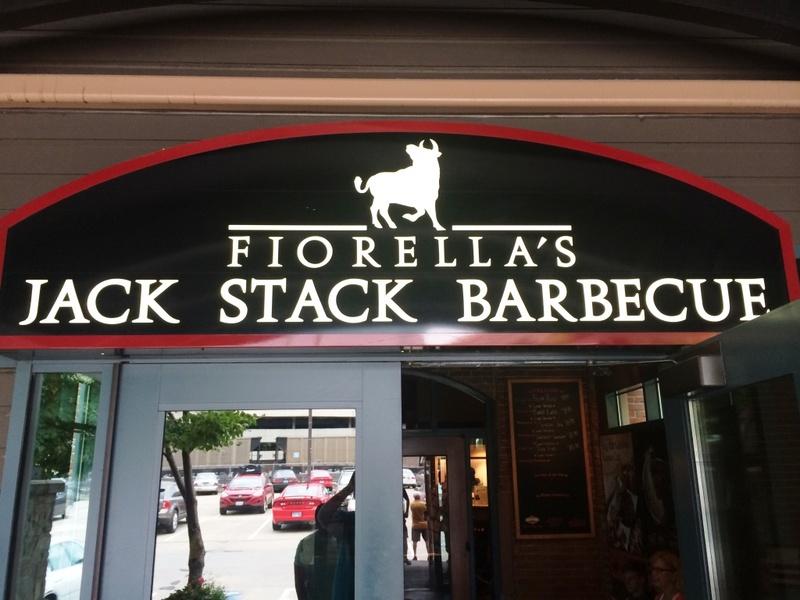 Clearly, it does not seem to be at the same level of Franklin or La Barbecue. Rudy: The wait seemed long for how long the actual line was. And their efficiency seemed poor, especially for a place that has been established for a couple of years. One of the positives for Micklethwait is that they are open until 6:00, so you can get barbecue later in the day than some of the other places that are only open until they sell out, which is normally early. However, they do sell out of some of their meats early in the day, so they might not have everything available later. The overall quality was not on par with Franklin or La Barbecue, but the brisket and sides were still better than most places. Overall, the barbecue was good at Micklethwait, and merits a return visit, especially because they have such good reviews elsewhere (maybe I just got a bad rib). However, I think next time I will get more brisket and try some of their artisan sausages. I also hope that their service is able to speed up, or it might not be a great option going forward no matter how short the lines could be. This past Wednesday night, I had the good fortune of attending another barbecue dinner at Midwood Smokehouse (who previously hosted Skylight Inn’s Sam Jones in November 2013), this time with special guest James Beard Award-winning author Robb Walsh. Just like last time around NoDa Brewing (and their head brew master Chad) was in the house, pairing each course with one of their beers. And as it turns out, Ed Mitchell happened to be there too! Now, I was planning to go to this event as soon as I got word of the event but then lucky for me, a marketing coordinator for Midwood reached out to the Barbecue Bros and offers a free press pass. Done and done. Backyard Barbacoa Cookbook, The Tex-Mex Cookbook, Nuevo Tex-Mex, and…well, you get the idea. And as I would come to find out over the course of the night, Walsh is no stranger to owner Frank Scibelli – he has consulted on both Midwood Smokehouse as well as his Tex-Mex concept Paco’s Taco’s & Tequila. Seeing as how I have yet to make it back out to Texas in several years (a fact which Speedy and Rudy like to hold over my head), the prospect of a Tex-Mex style barbecue menu intrigued me. The first course paired tortilla chips with three salsas (one of which was a revelation, unfortunately I can’t recall exactly which one), Frito Pie (a delight which I hadn’t yet experienced in all my years), and campechana (basically, a Tex-Mex shrimp cocktail) with NoDa’s CAVU blonde ale. I must say, if there weren’t two more courses coming, I could have eaten just Frito Pie all night long. Damn, it was that good. Beef rib and barbacoa served with tortillas highlighted the second course with NoDa’s Black IPA, Midnight Madness. 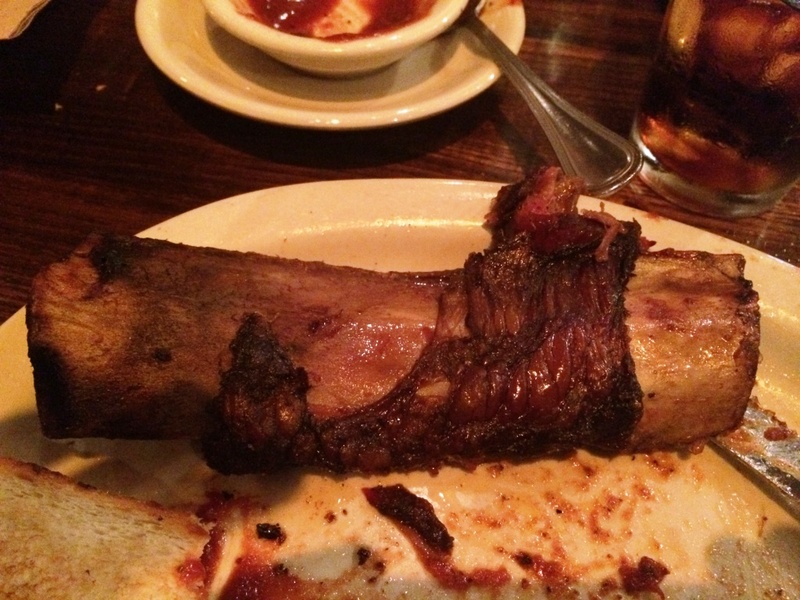 The beef rib was served both on and off the bone, and I came dangerously close to taking the entire bone for myself before realizing that oops, I should actually be sharing with the table instead of being a greedy freaking gus. But man, that thing was smoked to perfection and I’d be curious to see whether Midwood would ever offer it as a special – Frank Scibelli seemed to be taking an informal poll as to whether folks would ever buy it or not, so we shall see. Finally, we ended the night with a duo of mini pies and Jam Session Pale Ale. Thankfully, the pies were indeed mini and I didn’t have to stuff myself with a big dessert (plus another beer) after the big meal. All in all, the food in each course was new and interesting and fantastic. For the Sam Jones dinner, I recall them having four courses and I felt like we were constantly rushing to finish the food in each course and chugging beer. This time around, the three courses provided a nice balance between eating and drinking and actually being able to breathe between courses, converse with our table neighbors, and finish beers. So, whether done on purpose or just happenstance, well done by Midwood on the change. After dinner, I was able to speak briefly with Ed Mitchell and his son/business partner Ryan. I mentioned how much I loved his barbecue and was looking forward to what they would do next. After a period of time they will be making an announcement on what they’ll be doing next, but in the meantime it sounds like he might be doing some things with Frank at Midwood. Logistically, they would have to figure out how Midwood’s Texas-manufactured offset smoker would jive with Mitchell’s brand of eastern NC whole hog barbecue cooked over direct coals, but the prospect of Ed Mitchell smoking barbecue in Charlotte is just too exciting for me to handle. I also got a chance to briefly speak with Midwood’s Pitmaster Matt Berry and relayed to him and Frank the nice post from our meetup with Marie, Let’s Eat! posted earlier this week. Really nice guys, those two. I gotta say, I love these barbecue dinners (which benefit the Southern Foodways Alliance) and hope Midwood continues to have them when the right occasion presents itself. As long as they keep doing them you will find me there, press pass or not.